Fast Food – This Girl Loves to Eat! I love almonds! They are easily thrown into my Vitamix to make almond meal, almond flour or almond butter to spread on my morning toast, added to my smoothies to add healthy fat & as a protein boost, and, as it turns out, they are great for your health! I’m going into the kitchen now to grab a bowl to munch on during the football games. A much healthier alternative to our usual chips & dip! Since we were young we’ve all heard that breakfast is the most important meal of the day. Turns out that Mom wasn’t just trying to keep us from shoving candy and junk food into our pie holes by making us eat breakfast. If you are trying to lose weight, breakfast kicks your metabolism into gear and helps get your body into calorie burning mode for the day. Oatmeal – Steel cut with fruit, almonds and sweetened (if desired) with honey. 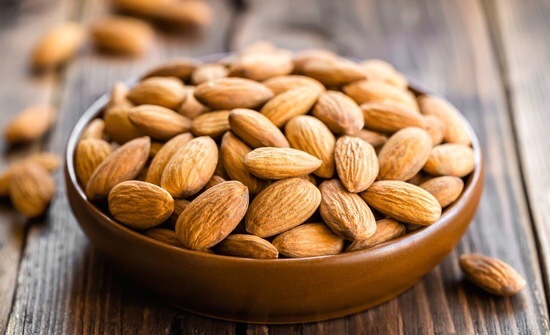 Another healthy option, the one that Barry Jay, Co-Founder of Barry’s Boot Camp, prefers, is to add a tablespoon or two of natural almond or peanut butter. Avoid pre-packaged oatmeal that’s high in sugar and low in fiber. Cheerios – Top with a sliced banana, and serve with non-fat milk and a hard boiled egg. Greek Yogurt – A great “Grab and Go” option. High in protein, just add a pinch of cinnamon and a handful of blueberries or raspberries to sweeten. Vegetable omelet or scramble made with 3 egg whites + 1 egg yolk (which provides protein, vitamin A, choline and B vitamins) a handful of fresh spinach, chopped tomato, a few chopped broccoli or cauliflower florets and, if you desire, a bit of feta cheese. Chocolate Peanut Butter Protein Shake – chocolate whey protein powder, natural unsalted peanut (or almond) butter, ice, unsweetened almond or coconut milk, cinnamon, and water. Any of these choices are hearty enough to keep you full until at least 10:00- 10:30 when you should have a mid-morning snack to keep you going. Keeping your blood sugar steady throughout the day helps keep your energy levels and attention up during the school day or work day, which is especially important if you are someone who operates heavy equipment or drives for a living. I’d want to be at my very best if that’s what I did! If you’re dieting it’s important to eat small amounts between your main meals for the same reason. When blood sugar crashes we are at our most vulnerable and most likely to reach for the nearest food to satisfy our hunger, which often isn’t the healthiest choice: drive-thru, pre-packaged snacks, etc. In my case, I always try (I don’t always succeed) to choose: a piece of fruit with a individually packaged cheese stick; a low net carbohydrate protein bar (I like Quest Bars); or a hard boiled egg and a glass of fresh sqeezed or whole fruit (no sugar added) juice like Cuties Tangerine Juice. If you’re like me, you do more in a day than most people and do for yourself last. I, for one, am slowing down to take care of my health because if I don’t, the rest of the people around me will surely fall apart. Moms are the grease that keep the squeaky wheel of the family turning and we need to start taking care of ourselves today. Yesterday is gone, we can’t change that, but we can change tomorrow. That change starts with breakfast, even if it’s just a glass of juice (or an apple or banana) and a hard boiled egg that’s been pre-made and peeled to grab and go on the way out the door. If you have a small to medium lunch or grocery type bag you can leave in the refrigerator that’s ideal. Boil a dozen eggs; peel once they are cool enough to touch (I plunge mine in ice water to stop the cooking); put 5 into a zip bag and then into the lunch bag. Put the other 7 into a second zip bag and put into the snack / deli drawer in your refrigerator. Fill 5 snack sized zip bags with 1-2 TBLS each natural (no sugar added) almond or peanut butter and put into lunch bag. Put 5 medium sized Apples and 5 individually wrapped low-fat cheese sticks into the lunch bag and put into the refrigerator. Make a note for yourself and put it with your car keys so you don’t leave without your snack bag. I’ve spent the past 5 days traveling cross country and back for a college graduation. I loved the trip, but hated the flight schedule and one of the airlines in particular (I’m talking about you Allegiant Air). How in the world does an airline have a plane that departs a 24 hour city (Las Vegas) at 6 AM filled with seats that don’t recline?? MAJOR FAIL! The cost of a one way flight from Las Vegas to Oklahoma City was great ($103 each with the stupid $15 carry on bag fee, $6.59 credit card processing fee, and the various taxes and fees) but the lack of reclining seats for a 3 hour flight is a deal breaker! Having finally gotten back late Monday afternoon, with a cough, sore throat and ears that ached, all I wanted was a fuss free meal, some cough medicine, and to sleep in my own bed. Thinking back to when you were a kid, what meal resulted in no complaints ever? If you were me, that complaint free plate featured a perfectly crisped grilled cheese sandwich. If my Mom wanted to make me really happy she’d serve it alongside a bowl of Campbell’s Tomato Soup she’d doctored up with milk, butter and freshly popped popcorn floating in it. That’s my idea of heaven! Knowing the schedule of the flights I’d booked, the likelihood of tornado delays (big thanks to Jim Cantore at The Weather Channel), and that I would be eating huge meals & drinking a lot of wine over the weekend, I had prepped my kitchen ahead of our trip with the essentials. Once cooking is complete slide the sandwich out of the pan and onto a plate. Slice down the middle and enjoy the gooey goodness. Yeah, that (and a glass of ice cold milk) makes this girl happy! So my first foray into pressure cooking went off without me getting maimed or burned, so I guess I’ll be using my new toy again soon! I made a huge batch of quinoa that turned out light, fluffy and quite tasty. Just one problem: we aren’t big eaters of any grain at dinner time outside of rice, so I was left at a bit of a loss as to what to do with my big bowl of quinoa. The cupboards, refrigerator and freezer were rather bare due to the two week vacation we had just returned from, so I was left with very few options. A lemon, Roma tomato, small avocado, a bag of frozen edamame, and 1/2 lb of frozen diced chicken breast were all I could salvage to throw together some kind of dinner hearty enough to satisfy my husband. Juice the lemon, stir in the arrowroot and set aside. In a medium frying pan, heat 2 TBLS olive oil and the minced garlic over medium-high heat. Add the diced chicken, season with freshly ground sea salt and pepper, and brown for about 2 minutes per side. Add the edamame, dill, cayenne pepper and lemon juice mixture to the pan and continue cooking about 3 minutes until edamame and chicken are done and sauce is well incorporated. Spoon about 1/2 Cup of the cooked quinoa and about 1/3 of the chicken mixture into a bowl. Top with the diced avocado and tomatoes and add more ground pepper to taste. Light enough for my post-vacation diet yet hearty enough that 2 bowls satisfied my husband’s appetite. Win-Win! When the Subway near my house opened I was ecstatic. Finally there would be a healthier option than I’ve had in a pinch: Del Taco, Carl’s Jr & Wendy’s. I’m sorry to say now, I wish it would close. I went this evening, giving this location its umpteenth chance to impress me but I was disappointed once again. In front of the oblivious crew member who finally saw fit to help me (the only customer in the store at 6:15 PM on a Sunday), I snapped a photo on my phone of the item on their menu I intended to order two of: the foot long tuna sandwich. 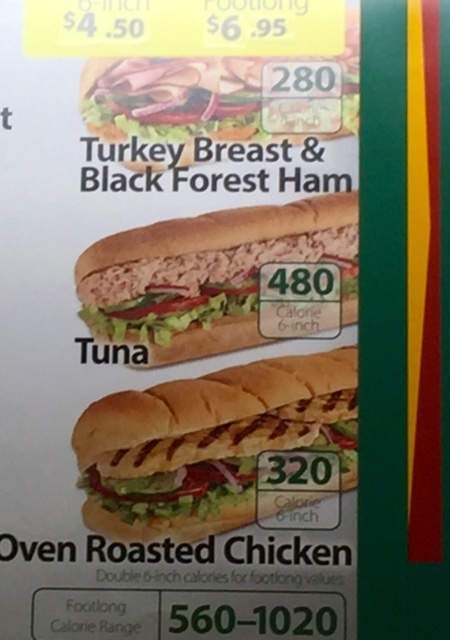 The photo on the menu shows a sandwich overflowing with fresh vegetables and mounds of tuna. As you an probably guess, my sandwiches came nowhere near resembling the ones shown on the menu board. The team member helping me asked me for my bread selection first. Despite the menu showing quite a few options I only saw a few each of the white, wheat and cheddar jalapeno rolls. I was under the impression that all of their options were available every day. Strike 1! Having settled on the cheddar jalapeno rolls, I then ordered the two tuna sandwiches one with Swiss and the other with Provolone cheese. Over the years I have seen the amount of tuna go from 6 overflowing scoops to 5 and tonight he put 4 full only to level, scoops of tuna and thinly spread it across most of one side of the roll. Once he put the 4 1/2 slices of cheese (that looked more like 1/3 cuts) on you couldn’t see any evidence of tuna at all. 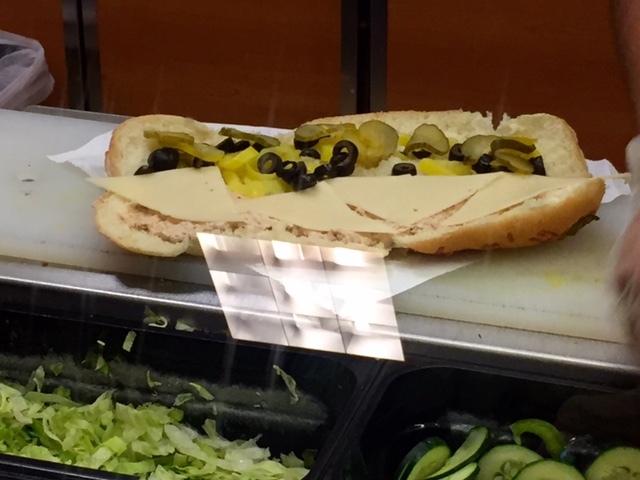 I told him that the first sandwich should only have mayonnaise, pickles, olives and pepperoncinis on it. He haphazardly threw a few of each item on the bread and, again, I blatantly snapped a photo of the sandwich he had made. This is what my husband’s looked like just before he folded it closed, cut it in half and wrapped it. Not only had he forgotten the mayonnaise, but he didn’t even distribute the pittance of the ingredients he did add evenly across the sandwich. Strike 2! The second sandwich should have come out looking a little less anemic, considering I was putting many more ingredients on mine. Once again this guy, and this location proved me wrong! 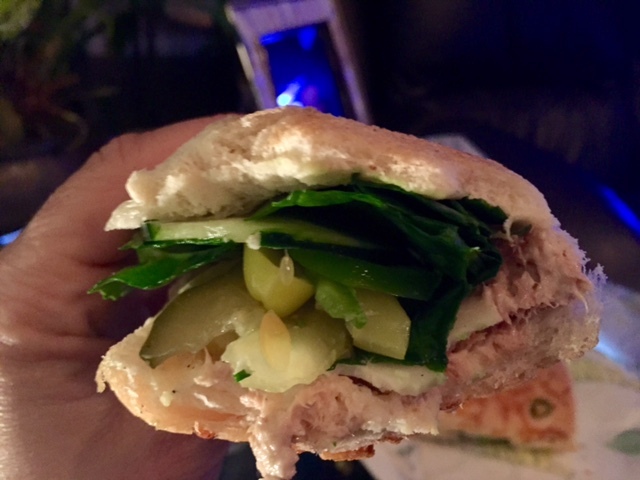 He asked what I wanted on mine and I indicated (as he was filling the sandwich) that I wanted cucumber, spinach, bell pepper, pickles, pepperoncinis and salt & pepper. He missed the cucumber completely (despite me reminding him twice). He took a very small grab of spinach leaves TORE THEM IN HALF and scattered them on the bread, put 4 skinny slices of bell pepper, counted out 6 pickle slices and then a few pepperoncini SQUISHED the sandwich closed angrily, wrapped it and sliced it in half. The minimum wage earning sandwich “artist” took no pride in what he was doing and quite frankly seemed like I was bothering him by asking him to make and sell me two sandwiches. Excuse me for asking you to do your job! Strike3! 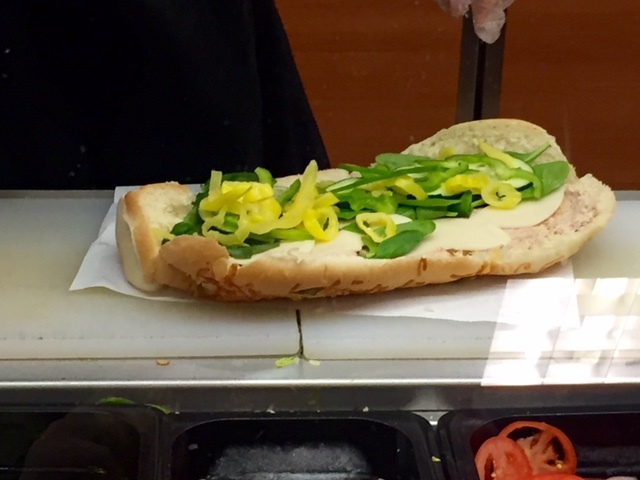 The sandwich shown on the left comes nowhere near looking like the sandwich shown on the menu board. As such, I cannot imagine that anything Subway has factored into their calorie and nutrition counts for the sandwich (other than the slightly stale bread) comes close to what the real nutrition value is for a Tuna sandwich made at this Subway. Suffice it to say tonight was the last time I will waste my money in this local business.